We have some good news. We’re thrilled to announce the general availability of the latest version of Sugar (Spring ’18 for Sugar cloud customers and Sugar 8 for on-premise customers). We have already previewed many of the data privacy features coming in this version of Sugar. Here are some more expansive thoughts from SugarCRM’s co-founder Clint Oram on SugarCRM’s commitment to data privacy. What’s else is new Spring ’18? Since the introduction of Advanced Workflow, you’ve been able to automate countless manual processes in Sugar. In Sugar Spring ’18, we’ve enhanced Advanced Workflow with run-time execution. With run-time execution, you can add a time element at any stage of your workflow; you can change fields or add related records after a specified amount of time. As an example, you can associate a task for an account manager to follow up with a customer exactly 45 days after they purchase your product. Introduced in Winter ’18, the Product Catalog Dashlet brought our Configure Price Quote (CPQ) capabilities to a whole new level with the ability to navigate products within the dashlet, conveniently explore product details, and add products to quotes with a single click. In Spring ’18, the Product Catalog Dashlet is now available as a dashlet throughout Sugar. In the Accounts and Opportunities modules, users can now use the Product Catalog Dashlets to create pre-populated revenue line items. 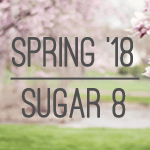 What’s new in Sugar 8? Sugar 8 delivers a completely modernized user experience of the Sugar application. The Sugar 8 UI offers a more elegant design that provides superior legibility and ease-of-use. Plus, it is now consistent with Sugar mobile. Users can view and interact with Sugar data by simply clicking into a chart segment. Within the list view, users can now perform in-line edits, mass updates and more, which is immediately reflected in the associated chart dashlet. Actionable Drill-Through Charts delivers a big impact on the efficiency of the user of Sugar by bringing more insight to the forefront. I’ve only touched the surface on all of the improvements we made to Sugar. I encourage you to take a look and experience our latest release and, as always, please visit our documentation and release notes at https://support.sugarcrm.com/Documentation/ for more details.